Background and Objective: Retrosternal goiter (RSG) is a term that has been used to describe a goiter that extends beyond the thoracic inlet. Surgery plays an important role in the treatment of these patients, but whether all or selected patients with RSG should undergo this operation remains controversial. Our aim is to look into the demographics, presentation, and treatment of patients with RSG and essentially to determine the role of surgery in its treatment. Setting and Design: Retrospective study, teaching hospital-based. Methods: Retrospective analysis of 537 thyroidectomies performed at King Khalid University Hospital between 2003 and 2010. The twenty-six patients with RSG were analyzed further, with regard to demographics, presentation, indications, and outcome of surgical treatment. Statistical analysis was performed, where age was expressed as mean and range, and other variables were presented as numbers and percentage. Results: There were 26 patients (4.8%) with RSG out of 537 thyroidectomies, who underwent an operation for removal of RSGs, in a seven-year period. The most common presentation was dyspnea (34.6%) and the surgical procedure predominantly used was total thyroidectomy. The RSGs were removed by collar incision in 96% of the cases. The final histological diagnosis revealed malignancy in 26.9% of the thyroid specimens. There was no mortality and minor complications occurred in nine patients. Conclusions: The presence of an RSG is an indication for surgery owing to the lack of effective medical treatment, the higher incidence of symptoms related to compression, low surgical morbidity, and the risk of malignancy. Objective: This study tried to evaluate whether a methacholine test may be influenced by the seasons. 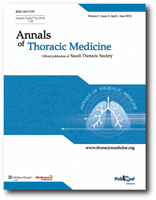 Methods: We considered 4826 consecutive subjects with normal spirometry (50.53% males; age: 35.1±16.2; forced expiratory volume in one second: 99.5±13.0%) who underwent a methacholine test for suspected asthma symptoms between 2000 and 2010. They were subdivided into four groups, like the seasons, according to the test dates. Results: A total of 1981 (41%) resulted normal (no PD 20 was obtained with 2400 μg of methacholine); the others showed a mean LogPD 20 of 2.52±0.5 μg. 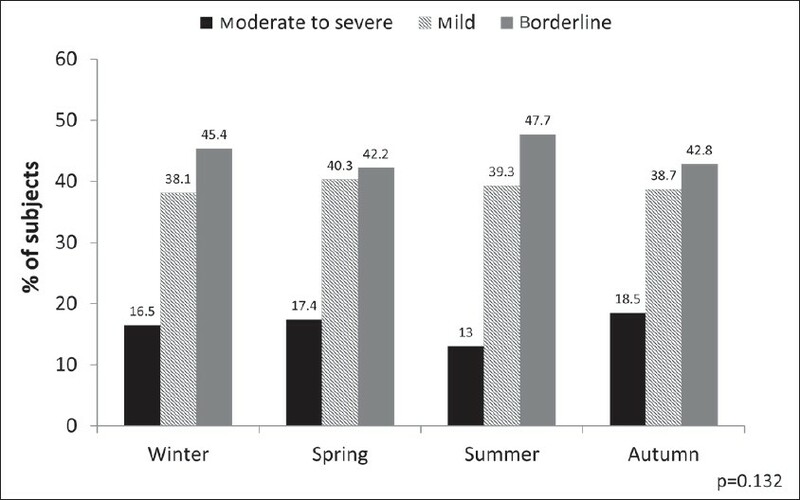 The number of subjects with bronchial hyper-responsiveness (BHR) found in autumn (789, 62.3%) was higher than in summer (583, 56.7%; P=0.03). A higher number of females and overweight/obese subjects showed a BHR in autumn compared with the other seasons. The spring mean LogPD 20 value (2.48±0.48 μg) was lower if compared with the one measured in summer (2.59±0.49 μg; P=0.05). LogPD 20 value was lower in females and non-smokers in spring compared with summer (P<0.05). Overweight/obese non-smokers showed a lower LogPD 20 in spring and autumn compared with that in summer (P<0.05). Autumn was a risk factor (OR: 1.378; P=0.001) for BHR (using a PD 20 <2 400 μg as BHR limit), while spring (OR: 1.330; P=0.021) and autumn (OR: 1.331; P=0.020) were risk factors for a more severe BHR (using a PD 20 <400 μg as BHR limit). Conclusion: There was a higher probability of finding BHR in outpatients with suspected asthma in autumn and spring compared with summer. Spring is the season where BHR may be more severe. Females and overweight/obese subjects were those mainly involved in this seasonal variability of BHR. Introduction: Prolonged use of oral corticosteroids is a risk factor for osteoporosis. However, the effect of inhaled corticosteroids (ICS) on bone mineral density (BMD) of asthmatic patients remains controversial. Objectives: We aimed to determine the prevalence of osteopenia and osteoporosis in our patients with asthma receiving ICSs for more than one year compared with patients who did not have asthma and to determine the risk factors for osteopenia and osteoporosis among the asthmatic patients. Methods: This was a cross-sectional study conducted from August 2007 to July 2009. 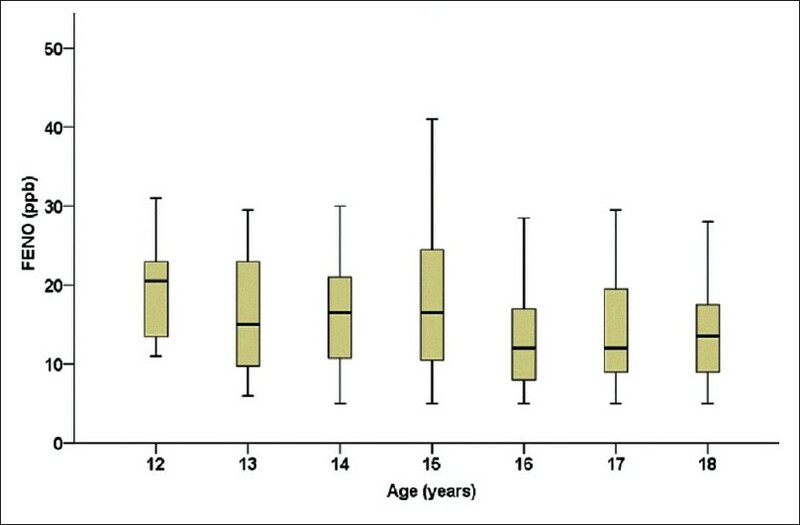 Asthmatic patients aged 18 years and older who had been on ICS for at least one year and a control group of subjects not on ICS were included. BMD was measured using DEXA (dual energy X-ray absorptiometry) scan. The WHO classification of T-scores for osteopenia and osteoporosis were used. Results: A total of 143 subjects were recruited (69 asthmatics and 74 control subjects). T-scores of the spine, femur, and hip of the asthmatics vs the control subjects were mean, −0.72 vs −0.57 (P=0.98); median, −0.60 vs −0.80 (P=0.474); and mean, 0.19 vs 0.06 (P=0.275); respectively. T-scores of the spine, femur, and hip showed significant negative correlation with age and significant positive correlation with body mass index (BMI). Conclusion: The risk factors for osteoporosis and osteopenia among asthmatic patients were older age and lower BMI, but not the cumulative dose of ICS. 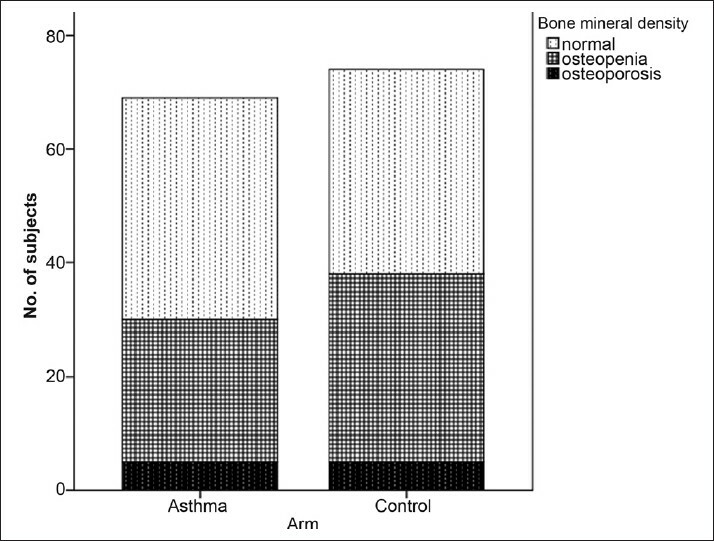 Asthmatic patients on ICS have no added risk of osteoporosis or osteopenia as compared with non-asthmatic subjects. Objective: Multidrug-resistant Acinetobacter baumannii (MDRAB)-associated pneumonia has been a common disease and a therapeutic problem in hospitals. Interleukin-1 receptor antagonist (IL-1ra) has been considered a required role for host immune defense in pneumonia disease. The aim of this study was to investigate whether the variable nucleotide tandem repeat polymorphism of the IL-1ra gene was associated with MDRAB-related pneumonia. Methods: Sixty-six pneumonia patients were enrolled in the study: 36 subjects had MDRAB-related pneumonia and 30 controls had non-MDRAB pneumonia. Polymerase chain reaction, restriction fragment length polymorphism, and agarose gel electrophoresis techniques were used to determine the IL-1ra genotype. Results: The frequencies of the IL-1ra genotype in the MDRAB-related pneumonia cases were A1/A1, 0.889 and A1/A2, 0.111; the frequencies of the IL-1ra genotype in the controls were A1/A1, 0.333 and A1/A2, 0.667. A statistically significant difference was determined (P < 0.05). We also observed an increase in the frequency of IL-1ra A1 allele in the MDRAB-related pneumonia group. A statistically significant difference was determined (P<0.05). Conclusions: We suggested that IL-1ra polymorphism was associated with the risk of MDRAB-related pneumonia. Background: A wide range of medications are now available for the treatment of asthma and selection of the optimal treatment combination of agents is essential. Objectives: This study was designed to evaluate a self-reported drug prescribing pattern for asthma among Nigerian doctors in general practice. Methods: It was a cross-sectional survey conducted among general practitioners in six states of Nigeria. Results: For acute severe asthma, 75.9% of the doctors prescribed intravenous methylxanthines, which was combined with oral or inhaled short-acting β2 agonists (SABA) by 56.3% of them. Systemic steroids were prescribed mainly via the intravenous route by 58.8% of them. Aberrant drugs such as antibiotics, antihistamines, and mucolytics were prescribed by 25.6% of them. For long-term, follow-up treatment of asthma, oral steroids, and oral SABA were commonly prescribed, while inhaled corticosteroids (ICS) and ICS/LABA (long acting beta agonists) were infrequently prescribed. Aberrant drugs such as analgesics, antimalaria, and antihistamines were prescribed by 22.8% of them. About 48% of the doctors had never attended any form of update training on asthma management, whereas, only 16.3% attended update training on asthma within the last year preceding this study. Awareness of international guidelines on asthma treatment was poor among them with only 16.4% being able to mention any correct guideline on asthma management. Conclusion: The poor anti-asthma prescribing behavior among these doctors is associated with a low level of participation at update training on asthma management and poor awareness of asthma guidelines. The Nigerian Medical Association and the Nigerian Thoracic Society should urgently address these problems. 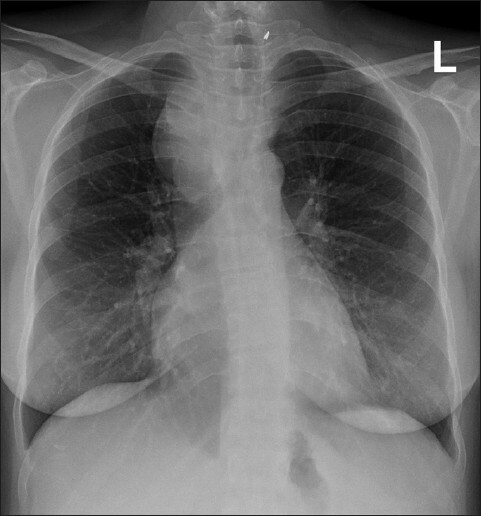 Purpose: Mediastinal lymphadenopathy (ML) is a cause for concern, especially in patients with previous malignancy. We report our experience with the use of endoscopic ultrasound-guided fine needle aspiration (EUS-FNA) with immunocytochemical stains in patients being evaluated for ML. 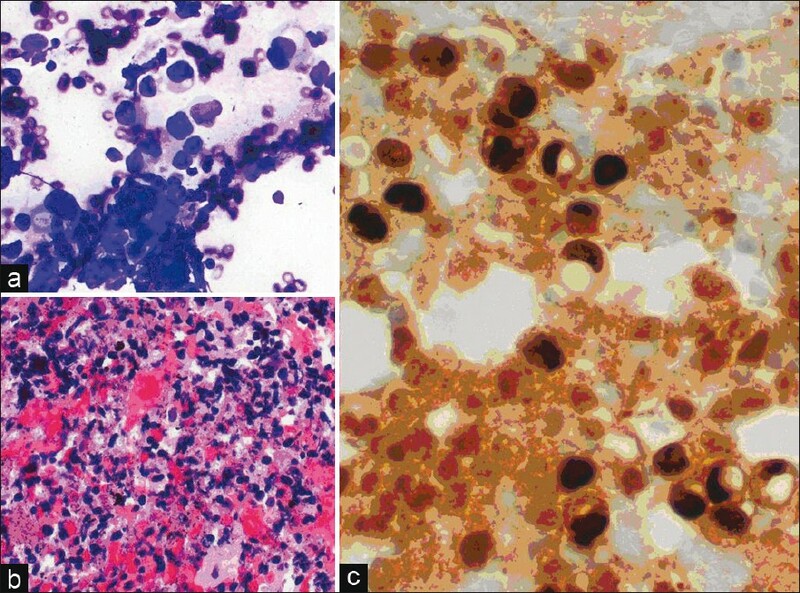 Methods: Retrospective analysis of patients with ML of unknown origin who underwent EUS-FNA. On-site evaluation was performed by experienced cytologist, and special immunocytochemical stains were requested as indicated. Results: A total of 116 patients were included, and a total of 136 mediastinal LN were sampled. Prior malignancy was present in 45%. The most common site of examined lymph node (LN) were subcarinal (76%, 103 LN). The median long and short axis diameters were 28 mm and 13 mm, respectively. FNA was read on-site as malignant, 21 (16%); benign, 100 (76.9%); suspicious, six (4%); atypical, 3 (2%); and inadequate sample, six (4%). Sixty-four LN were deferred for additional studies; 22 for immunocytochemical and 26 for Gimesa (GMS) stain and 21 for flow cytometry. Final FNA read was malignant in 28 (21%), benign in 103 (76%), suspicious in three (2%), and atypical in two (1%). Metastatic malignancies disclosed included Hodgkin's and Non-Hodgkin's lymphoma, melanoma, hepatoma, breast, lung, colon, renal, endometrial, Fallopian tube, and unknown carcinoma. The sensitivity, specificity, and accuracy of the final FNA read to predict malignancy were 100%. Conclusion: EUS-guided FNA with additional ancillary studies is useful in disclosing metastatic ML from a variety of neoplasms. Due to its safety and accuracy profile, it should be considered the test of choice in evaluating abnormal ML in appropriately selected patients. Background and Aim: Noninvasive ventilation (NIV) decreases mechanical ventilation indication in the early period of acute hypercapnic respiratory failure (AHcRF) and factors for success have been studied well. But, less is known about the factors influencing the NIV response in the subacute period. This study was aimed to determine the factors influencing the reduction of PaCO 2 levels within first 24 hours of therapy. Methods: NIV response was defined as reduction of PaCO 2 level below 50 mmHg within first 24 hours. Patients with AHcRF, treated with NIV, were divided into 2 groups according to this criterion; group 1 as the nonresponsive, group 2 as the responsive. The differences in NIV methods and characteristics of the two groups were evaluated and compared in this retrospective study. Results: A total of 100 patients were included in the study; 66 of them in group 1 and 34 in group 2. No significant differences were identified between the length of NIV application and intensive care unit (ICU) stay, intubation and mortality rates, across the groups. Ninety-one percent of the patients in group 2 had received all night long NIV therapy; this was just 74% in group 1 (P=0.036). Results of multivariate analysis showed that while nocturnal application was significantly associated with better response, prior home ventilation and requirement of higher pressure support (PS) levels significantly and independently associated with poorer response to NIV therapy. Conclusion: In patients with AHcRF, all night long use of NIV may accelerate healing by improving PaCO 2 reduction within the first 24 hours. 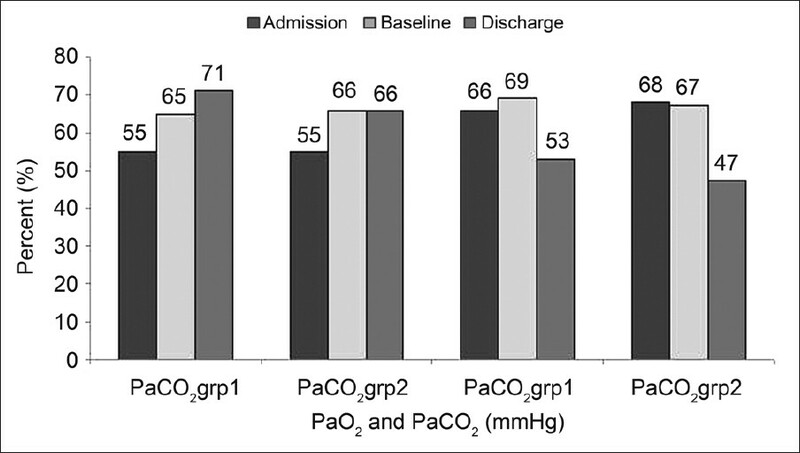 A rapid response in PaCO 2 levels should not be expected in patients requiring higher PS levels and using prior home ventilation. Context: Fractional exhaled nitric oxide (FENO) is a useful noninvasive diagnostic tool for asthma and some other pediatric respiratory diseases. Factors affecting FENO level are variable in different populations and studies. Aims: To estimate the normal values of exhaled nitric oxide for Qataris 12 to 18 years of age. Other objectives were to measure the correlation of anthropometric and other potential factors with FENO levels. Settings and Design: Community-based, cross-sectional study. Methods: A total of 438 Qatari national school children from both genders were randomly recruited in cross-sectional study. Of them, 203 were non-atopic and hence included in the statistical analysis. Questionnaires including personal data, demographic data, and other factors that may affect FENO level were distributed. Statistical Analysis Used: Comparison of means done using t-test. We performed Spearman's rho test to measure correlations. Data analysis was done using PASW 18.0 Release 18.0.0, 2009. Results: The geometric mean of FENO levels for all subjects was 14.1 ppb (upper level CI 95% - 36.3 ppb). FENO was significantly higher in males (R2 = −0.254, P<0.0001) and was negatively correlated with increasing age for the whole study population (P=0.036). This decline was interrupted by a significant upraise at the age of 15 years (P=0.0462) which seems to be driven by the males (P=0.0244). FENO levels were lower in subjects exposed to cats (P=0.019). We could not find significant correlation between FENO and other factors studied. Conclusions: Estimated FENO level with 95% CI in Qatari children, which is probably close to those in other Gulf countries, will be helpful clinically. The lower level of FENO with female gender, increasing age, and exposure to cats needs to be further studied to establish the association and to understand the underlying mechanisms. 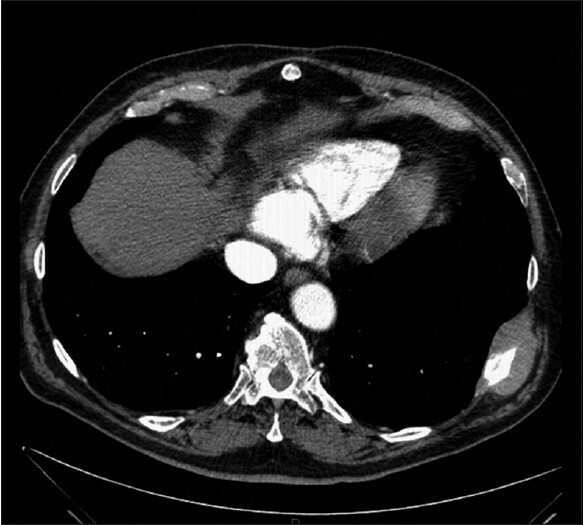 This was a case of a 35-year-old man with mediastinal mass requiring computed tomography (CT)-guided biopsy for tissue diagnosis. A posterior approach with an 18-gauge biopsy needle was used to obtain tissue sample. 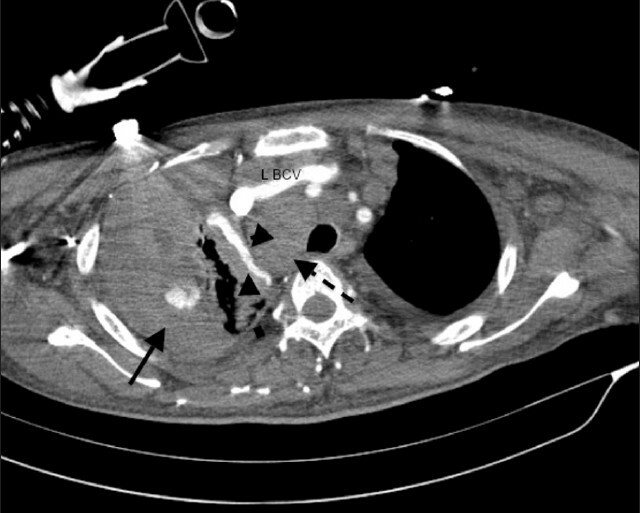 Post biopsy, patient condition deteriorated and multiphase CT study detected active bleeding in arterial phase at the biopsy site with massive hemothorax. Subsequent angiography showed arterial bleeder arising from the apical branch of the right pulmonary artery. Selective endovascular embolization with NBCA (n-Butyl cyanoacrylate) was successful. Patient survived the complication. The case highlighted a rare complication in a common radiology procedure and the value of the interventional radiology unit in avoiding a fatal outcome. 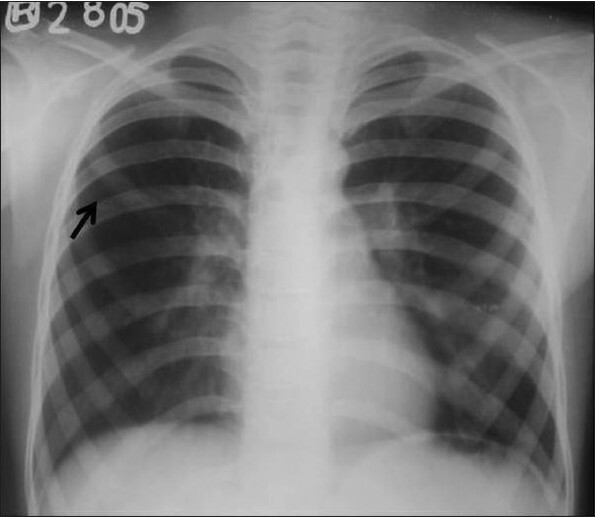 Poland sequence is a rare congenital anomaly involving the chest wall and arm, displaying differing degrees of severity, functional and aesthetic impairments. Here we report a series of two cases that presented to us with this anomaly. These cases illustrate, for physicians, the importance of physical diagnosis and reinforce the practice of looking for additional anomalies when one is discovered.